Setting a new single season career-high with eight ARCA starts, Leilani will make her third ever appearance at Kansas since making her series debut in 2010. Enjoying the benefits of sponsorship support from A Well-Fed World and TryVeg.com and the seat time that goes along with it, Leilani has notched two top-10 finishes on the season. The Minnesota native set a personal best eighth-place finish (fifth-place start) back in February during ARCA’s season opening event at Daytona International Speedway. She also finished ninth in her first attempt at Michigan International Speedway. 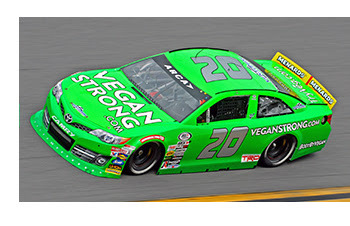 In addition to the racing, Leilani and her Vegan Strong team had an extremely successful trackside activation: they gave away 30,000 vegan cheeseburgers to race fans at her Daytona, Talladega, Charlotte, Pocono, and Chicagoland races. A biology graduate turned race car driver and environmentalist, Leilani, was named the No. 1 Eco Athlete in the World by Discovery’s Green Planet, and Sports Illustrated once named her one of the top ten female race car drivers in the world. An advocate for plant-based diets, solar power and animal rights, Leilani has made a career racing for a cause. Her past race cars have included messages regarding renewable energy and clean energy legislation as well as award-winning documentaries The Cove and Blackfish. There is one final race in the 2018 ARCA Racing Series presented by Menards season, the Kansas ARCA 150 at Kansas Speedway, scheduled for Friday, October 19. Practice is scheduled at 11:30 am ET/10:30 am CT, General Tire Pole Qualifying is set for 6:05 pm ET/5:05 pm CT, and the green flag slated to wave on the season finale at 8:30 pm ET/7:30 pm CT. The race will be televised live on either FS1 or FS2, depending on Major League Baseball playoffs; ARCARacing.com will have live timing & scoring, track updates, and scanner audio during all on-track sessions for registered users.